Non-alcoholic Irish drink recipes can make wonderful additions to your Irish cocktails menu. The following selection of "virgin" drinks includes single servings as well as punch recipes that are perfect for St. Patrick's Day parties. A Shillelagh cocktail is named after an Irish walking stick that was used as a club. The walking stick is a symbol of the Irish way of life, and the non-alcoholic version of the cocktail is an excellent choice for capturing the spirit of the culture. Pour the lemon juice, peach juice and powdered sugar in a shaker, and shake well. Strain the mixture over crushed ice. Garnish the drink with raspberries. The non-alcoholic version of an Irish rose cocktail is just one of many variations. Pour the ingredients over ice and stir. Garnish the drink with a maraschino cherry or a twist of lemon. 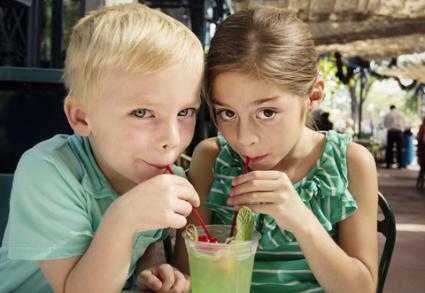 You can use lemon-lime soda instead of soda water for a sweeter drink. This version of the emerald champagne cocktail uses non-alcoholic replacements for Creme De Menthe and sparkling wine. Chill the sparkling grape juice. Pour the Creme De Menthe into a flute glass and slowly add the sparkling juice. Stir the drink just enough to blend it slightly. 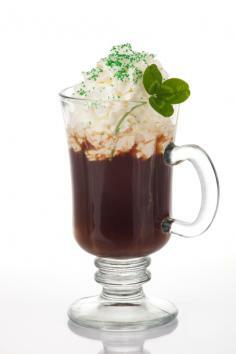 Chocolate mint shakes are excellent Irish drinks for Valentine's Day or anytime for a person who has a sweet tooth. Pour the milk, chocolate syrup and Creme De Menthe into a blender with the ice cream. Blend the drink to your desired consistency. Garnish it with whipped cream. Perhaps the most famous Irish drink is the Irish coffee. Over 100 versions of this popular drink exist, including non-alcoholic Irish drink recipes. Mix the coffee and sugar together in a warm coffee mug. Place a spoon right on the surface of the coffee and slowly pour the whipping cream over the spoon. Slowly move the spoon up as the layer of cream thickens to ensure that it remains on the surface of the coffee. Allow the cream to float on top without stirring. An eight ounce coffee mug made of clear glass is an excellent container for this coffee drink. Pour the cream and Creme De Menthe into a cocktail shaker with ice and shake well. Strain the mixture into a glass, and garnish it with mint leaves or a maraschino cherry. Puree the sherbet, water, sugar and lime juice in a blender. Put shaved or crushed ice into six glasses. Pour four ounces of the mixture into each glass, and top each drink with lemon-lime soda. Garnish the drink with the lime wedges and a sprinkle of powdered sugar. Pour lime juice and water into a punch bowl. Add sherbet, and stir the punch until it reaches a smooth consistency. Slowly pour lemon-lime soda into the mixture, stirring constantly. Pour the drinks over crushed ice, and garnish them with lime wedges. Non-alcoholic Irish drink recipes aren't just for St. Patrick's Day. Many of these recipes are perfect for gatherings or quiet nights all year long.